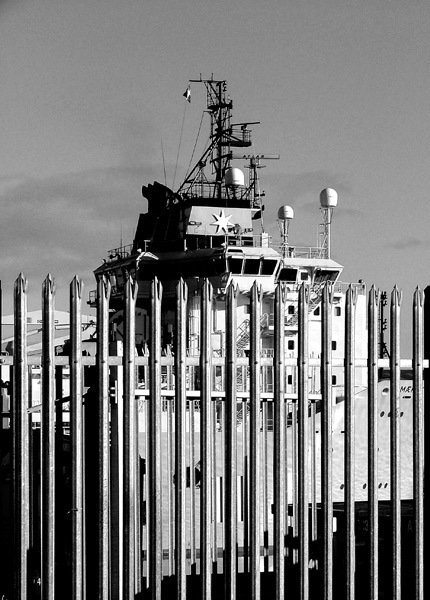 This group of three photographs was taken at Aberdeen Docks in 2004 under late afternoon autumnal sunshine: I have no record of the vessel's name. Although allowed to photograph in the harbour area this permission was for shooting only from outside its perimeter fence. Quite often there were long stretches of porous fencing between the buildings and other solid barriers. 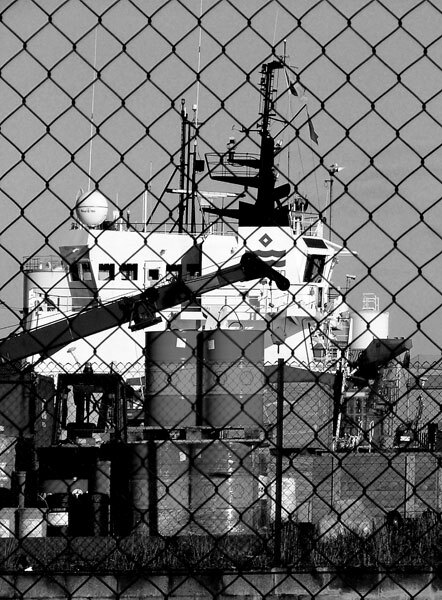 I liked the contribution this chain link fencing makes to the composition. This steel railing fencing added to the variety of barriers around the dock and seemed entirely appropriate. Sometimes access gates were open and offered unrestricted views. Owned by Moller-Maersk, this is an offshore tug and supply vessel at that time servicing North Sea oil industry installations. 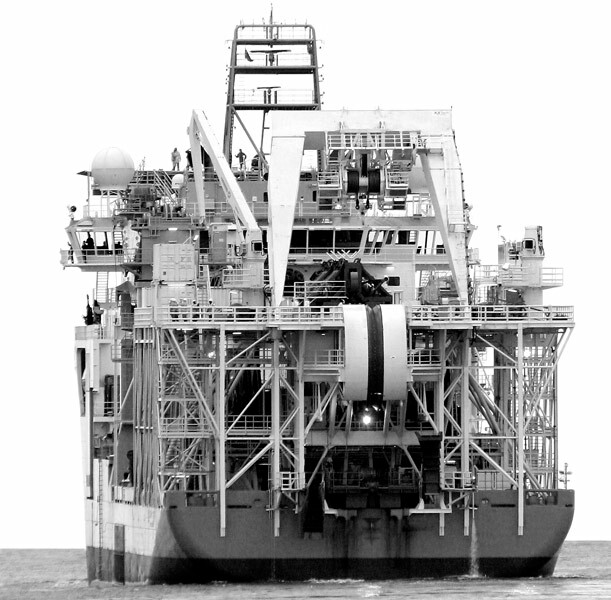 It displaces 6689 gross tons and was built in Denmark in 2003. 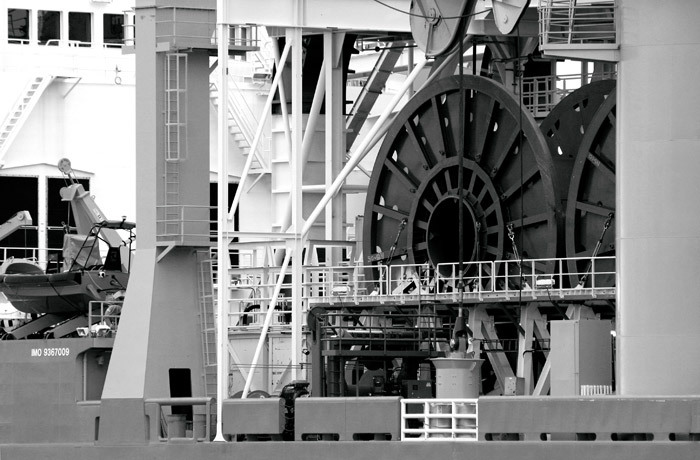 This shows large equipment installed behind the tall bridge deck of the Maersk Achiever I liked the relationships of forms within the frame. Named after Admiral Charles Turner Joy, this US Navy destroyer was commissioned in 1959 and withdrawn from service in 1982. Now maintained by the Bremerton Historic Ships Association as a museum, the vessel is moored close to the Puget Sound Naval Shipyard at Bremerton. The Seattle ferry terminal lies between the shipyard and the museum vessel. Its two hour return voyage is always spectacular, but especially so when returning to Seattle after nightfall. The C S Sovereign was built in the Netherlands in 1991. 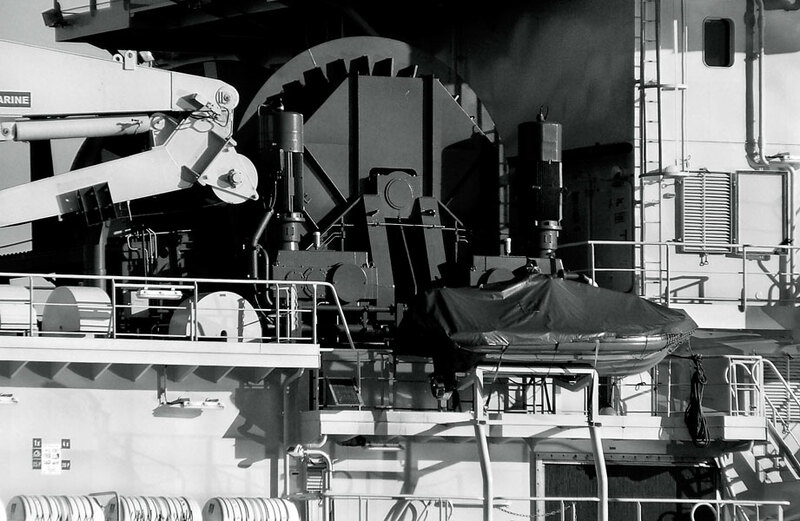 This photograph was taken in 2008 whilst it was refitting in the dry dock at the A & P Tyne shipyard in Wallsend. It currently lays undersea cable and pipelines. I liked the complexity of the structure, the pristine white of the new paintwork and the compositional symmetry. The last is owes nothing to me but everything to the fact that this is the only viewpoint of the dock from outside the perimeter wall. Unfortunately maturing vegetation is starting to intrude into the viewfinder. At another time and from the same A & P Tyne vantage point as the previous image I shot this fragment of an unidentified ship moored on the waterfront and framed by a mobile crane and a vessel in the dry dock. The large painted numbers seemed more important at the time than the ships themselves: I liked the scale the lone figure adds to the composition. This and the following image were taken from the quayside at North Shields on October 24 2007 as the Normand Seven sailed out of the River Tyne and into the North Sea. 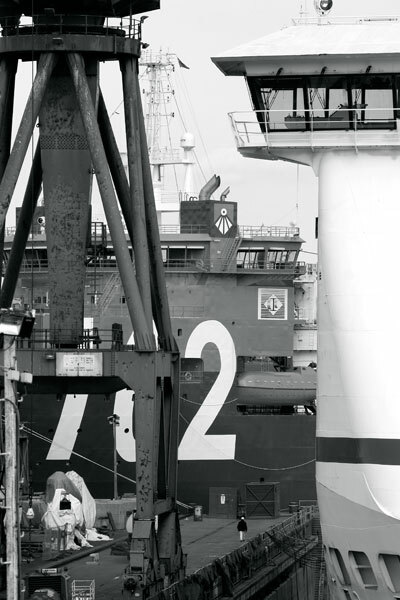 It had been refitted at the Hebburn yard of A & P Tyne and this was the maiden voyage in its new incarnation. I intended to complete closely spaced shots that could be sequenced to show its slow passage across me from the approaching bow to the diminishing stern. I may post some of these at a later date. 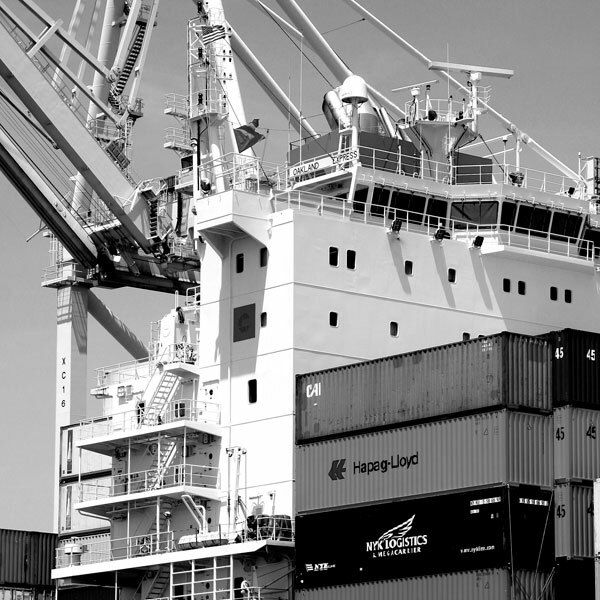 The high-speed ferry between San Francisco and Oakland passes down a long parade of ships moored at the Oakland International Container Terminal. The high stacks of brightly coloured containers and the white unloading structures offered creative possibilities but as in any photographic drive-by there were practical problems. 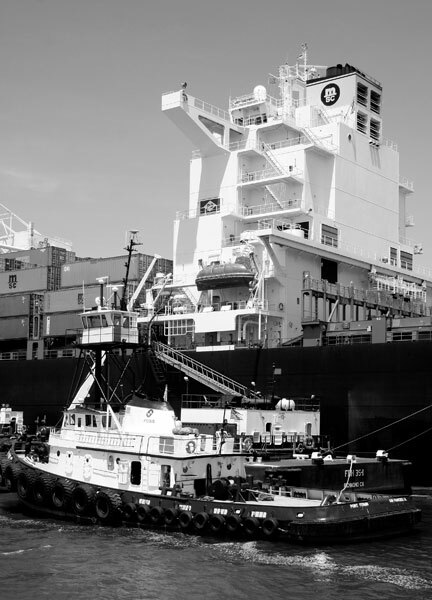 In this shot a tugboat and support vessel lie alongside one of the container ships. The ferry was quite stable but its speed made composition and capture a shade more difficult than on board a more leisurely paced conventional boat. 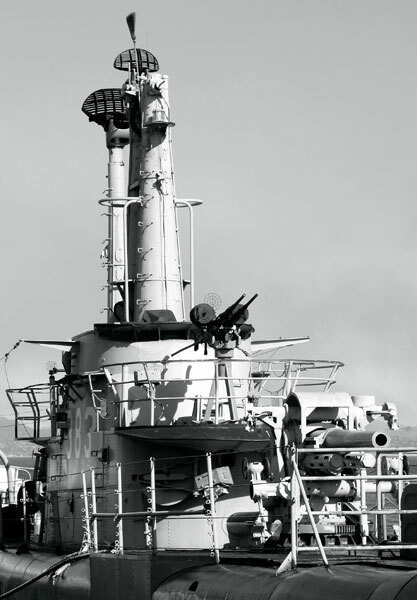 Launched in 1943 from the Portsmouth Navy Yard in Maine, the USS Pampanito completed six operational patrols from Pearl Harbour during World War Two. 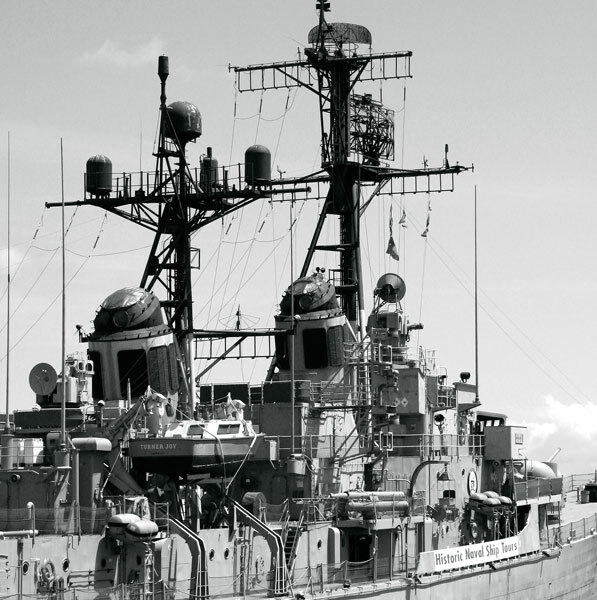 Decommissioned in 1945, the submarine served as a Navy Reserve Training Ship until final retirement in 1971. Since 1975 the Pampanito has been based in the San Francisco Marine National Park where volunteer efforts have concentrated on restoration to the equipment and appearance of 1945. From 1820, J.L.Tompson & Sons constructed ships in their North Sands yard on the River Wear in Sunderland. In the 1930's they produced a simple coal-fired, steam powered, cargo ship to a standard design that sold well. In 1940, Britain contracted construction of 60 of them to American shipyards where its simplicity was developed further as the basis for the 2,751 'Liberty Ships' built by 1945. 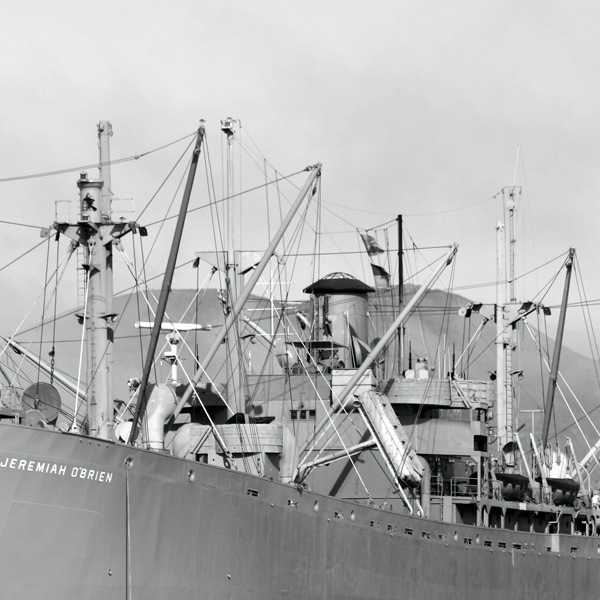 The Jeremiah O'Brien is one of two survivors and operates from Pier 45, San Francisco. 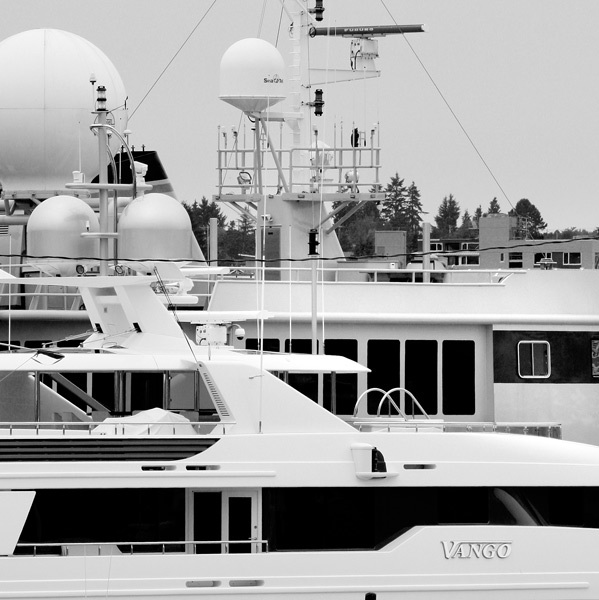 A small number of large and lavish privately owned boats were moored at this point on the southern shore of Salmon Bay, a broadening out of the narrow channel linking northern Lake Union to the open waters of Elliott Bay through the shipping locks at Ballard. I 'owned' working model boats I constructed as a boy but cannot imagine owning and sailing in a boat like these. Built in Louisiana and launched as the Sea Vixen in 1976 this tugboat had several owners and four name changes before this photograph was taken. Severely fire damaged off Alaska in 1999 she was towed to Seattle to lie derelict before refitting. 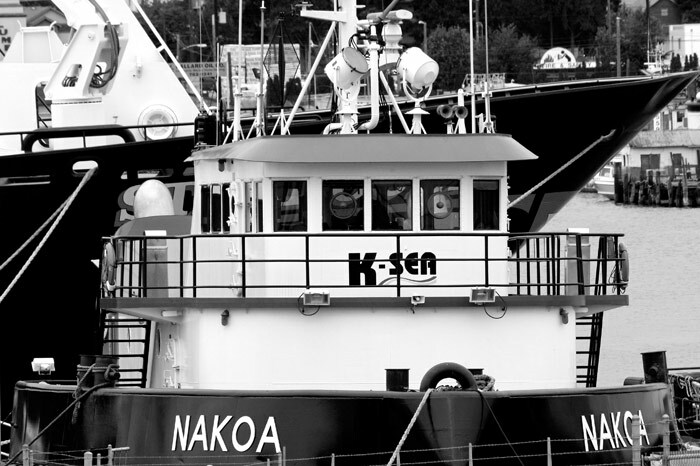 Now owned by K-Sea Transportation, the immaculately painted Nakoa was shot near the Hiram M Chittenden Locks at Ballard in 2009. 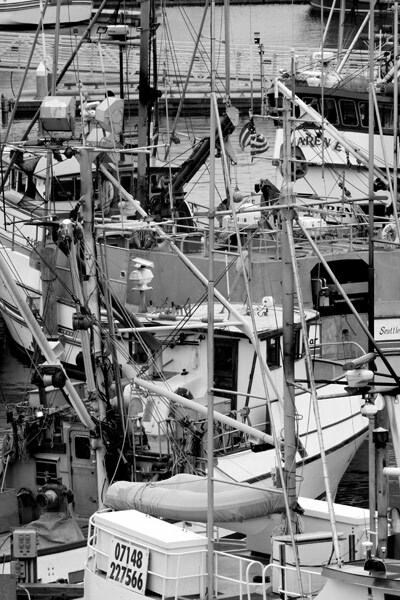 On application, and for a fee, the Seattle City Council will grant a licence to photograph within the Fishermen's Terminal. Working from Ballard Bridge overlooking the Dock does not provide the same creative scope as the quaysides but is useful enough on a walking tour of the area. I liked the jumbled layering of boats and their component parts much as I did when taking the photographs posted in the Tall Ships galleries. On that same day in Seattle I walked from Fremont Bridge along the northern shore of Lake Union to the Gasworks Park that preserves much of the ironwork from the gas generating plant operational from 1906 until the late 1950s. 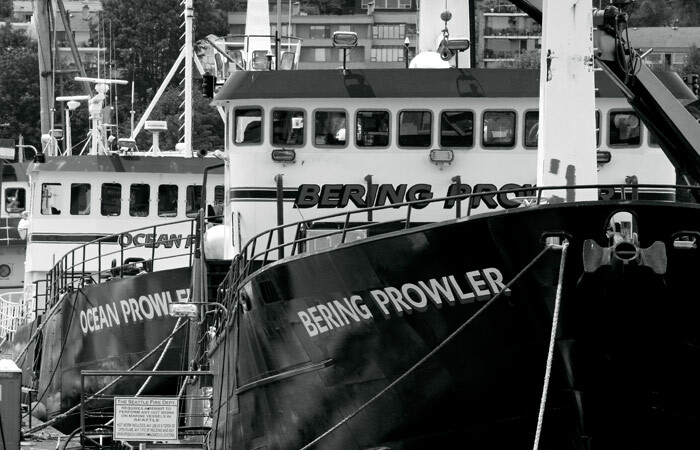 On the way I passed these two boats operated by Prowler Fisheries on long line fishing in the Gulf of Alaska and the Bering Sea. This cruise ship was built in Germany by Meyer Werft and entered service with Royal Caribbean Lines in 2001. Carrying 2,500 passengers, it's principally powered by gas turbines rather than the usual reciprocating diesel engines. 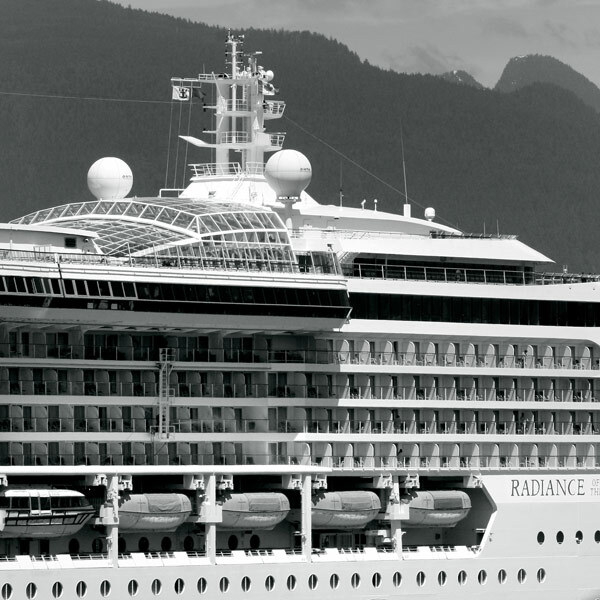 The photograph was taken alongside the Canada Place quay in Vancouver in 2010, perhaps as the ship docked during an Alaskan cruise. 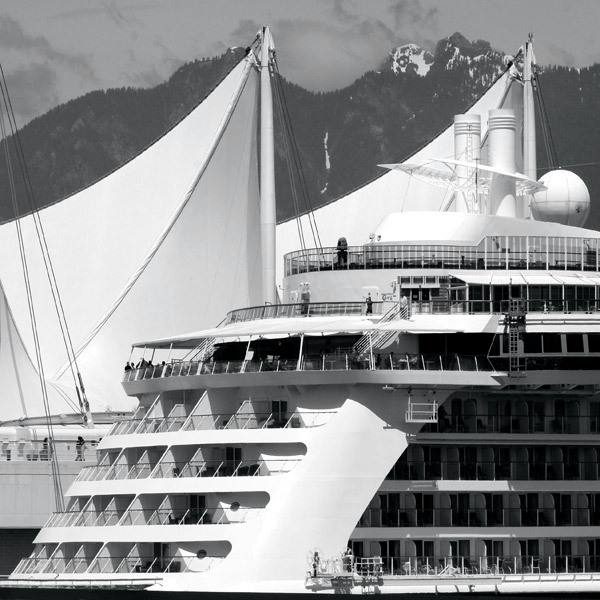 The Canadian Pavilion for the EXPO 85 was designed by Eberhard Zeidler and has since been adapted and extended as a cruise ship terminal. Here, I liked the manner in which curves and counter-curves on ship and architecture dominate the composition. 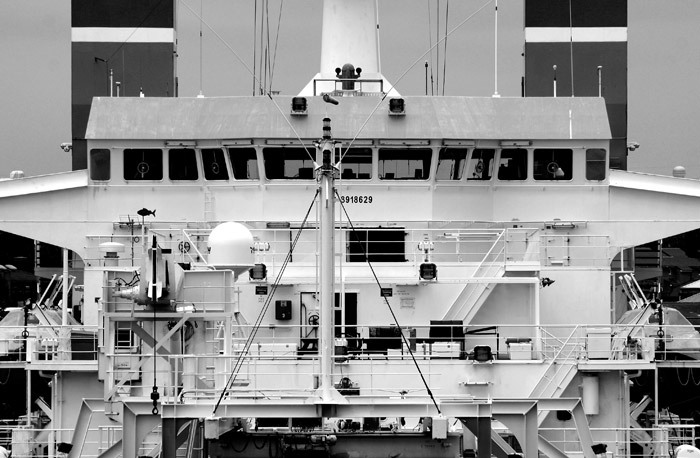 For me, the ship's stern works visually but its whole ‘horizontal tower block' form lacks the overall aesthetic appeal of liners such as the Mauretania, Bremen, Normandie, United States and the Queen Elizabeth 2 from the twentieth century.